While the Middle Ages treated playing cards as objects of sorcery and the more reasonable French introduced the four main suits that are still used today (hearts, clubs, spades, diamonds), a more recent development almost changed everything we thought we knew about a full house. There was once a fifth suit. In the late 1930s, the United States Playing Card Company was one of several manufacturers to introduce a 65-card deck. In addition to the four established suits, the packages contained a fifth: the eagle. (In England, companies sometimes used a royal symbol of crowns depicted in blue.) 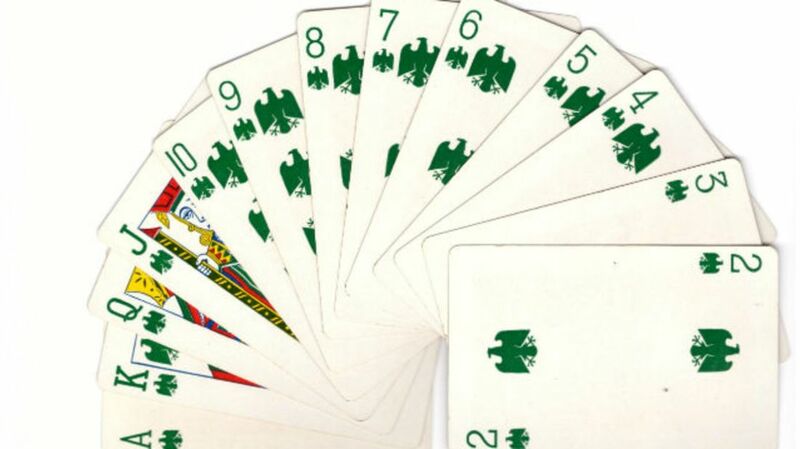 The cards were green instead of red or black and were intended for use in bridge games. Hoyle’s Modern Encyclopedia of Card Games makes a passing reference to the suit in its index; collectors who have gotten the deck have noted it contained instructions for playing a five-suit version of poker, where Five of a Kind was a possibility and terms that now seem strange to the tongue and ear (“Queen of Eagles”) were commonplace. But where did the notion come from? Though other mentions of four-plus decks appear in playing card retrospectives, playing card historian Andrew Ward attributes the idea for five-suit bridge to Walter Marseille, a Viennese psychologist who thought the added cards made the games more complex and interesting. While bridge players seemed intrigued by the variation—decks routed to New York for retail sale were snapped up immediately—it posed a formidable concentration challenge. According to media coverage of the era, most people had enough trouble focusing on 52 cards, let alone 65. “The brain cells of average bridge fans are sorely taxed by the strain of 52 cards and four suits through the complex sequence of play,” Life magazine wrote in 1938. “To players with durable memories the new game offers a challenge, to others a high hurdle.” One journalist sniped that “four-goal football” might be next. The naysayers were correct. While popular in Europe for a time, five-suit games never really caught on. By the end of World War II, the eagle was nowhere to be found, and Marseille's contribution was largely forgotten.